This is a description of the preparations for the trip and a report on the journey itself. At that time I worked in Tokyo that is why it is starting there. This little summary of the preparations is not written to scare-off people, which dream to do a similar trip but to make them realise what to think of and what to prepare. Of course first the idea is born to realise a dream of a little adventure again. I say again because one should not dare to prepare for such a long trip without having made similar shorter journeys before. The original dream-route was to start in Singapore but it was impossible to obtain a visa for crossing from Thailand into Burma and from there enter into India by land. The next alternative was to start in Shanghai, but personal relations to the Chinese Embassy indicated soon that the chance was nil at this point in time. The third alternative route was to start in Eastern Siberia and from there all the way to the West. But through a helpful exiled Russian I was informed that the Russian Embassy would not flatly say "No" but explained that there are no hotels on the way. So the only alternative left was to start in India and I decided for Bombay because the clearance of ships are supposed to be shorter and shipping expenses are half compared with Calcutta. When looking at a map one can easily recognise that there are only two routes to Europe. When I asked at the Afghan Embassy for a chance of a visa they replied that they would probably issue one if the Russians allowed me to enter Afghanistan. They did not. Afghanistan was occupied by the soldier of the then Soviet Union. As the route was finally fixed, I could start doing the down to earth preparations (detailed routing is here of no interest I believe) i.e. decide on the car, decide on the schedule, prepare the car, check on what documents are required for the car, the tour and the travellers. - ship's arrival in Bombay in early July. The choice of the most suitable car was one of the most important decisions. I knew the smaller Toyota Station Wagon from a trip in Sulawesi and decided against it because of its too hart springs. For a long distance drive the Toyota Land Cruiser Diesel (the big brother) is much more comfortable and proved to be a good decision finally as there were no problems at all during the entire trip of nearly 20.000 Km. After a rough decision about the route, the time required and the distances had been worked out we knew more about the requirements to be prepared, e.g. parts, food, maps etc. There are quite a number of car accessory shops in Japan. However none of the shops had any experience to equip a four wheel drive car for a trip which I planned. They prepared cars to drive in groups through little rivers and mud. In other words I had simply to judge myself for the equipment needed. Road maps of India, Pakistan and Iran were not available in Japan except for a general Bartholomew Map. There was no other choice than to search for a map after arrival in the respective countries or approach the Automobile Club of the country. Only for Iran we had an old but good map received from an Iranian friend, which carried the marks of the Shah of Iran which had to be cut-off for safety sake. I wrote to Automobile Clubs in India and Pakistan but only the Indian club replied and sent me relative good road guidance information but no maps were available. Babusar Pass. Fortunately we did not reach the pass due to broken bridges and landslides. A Carnet de Passage for the car was required for India, Pakistan, Iran, Turkey and Bulgaria. This "Carnet de Passage" is a document issued by the Japan Automobile Federation whereby the Japan Automobile Federation warrants and guarantees to pay the respective import duty to the customs of the country in case the owner sells his car. This in turn means that the Japan Automobile Federation required a bank guarantee of DM 60.000, - from the owner of the car as coverage if the car was sold somewhere abroad. But even with a bank guarantee it is not simple to get a Carnet de Passage from them. They want to be sure that the traveller is a serious traveller and not "only an adventurer". So it takes time to stay in contact with them, give references until their "feelings" are satisfied. This does not apply to a foreigner only but is even rather more restrictive for Japanese. For many countries, this document is mandatory and any driver not holding it may be barred from entering the country by car. Advance visa for the travellers were only required for India and Iran (for Germans). The visa for India is obviously not problematic and I even succeeded to get a recommendation letter for the custom officers to handle my load of films generously because I had more than 50 Super 8 and 100 slides films with me. The Iran visa proved to be a bit more difficult. We remember that America and Iran had some serious unsolved problems at that time already. Because all white men were Americans in the eyes of Iranians I was advised by the Embassy staff to be very cautious when travelling in Iran. I was told that a visa would only be issued 2 weeks prior to departure depending on the approval in Teheran. One can imagine my feelings of uncertainty until the last moment. The friendly young man at the embassy with whom I had talked several times disappeared just 3 weeks before my scheduled departure. He was ordered back to Iran and obviously did not like the idea very much. Nevertheless his successor confirmed the promise and I have been served a cup of tea and biscuits on the day I received the visa. It was a Saturday. I had never been served tea at an embassy not to talk about Saturdays. Toyota gave us the addresses of their service-network in Pakistan incl. the name of their representative but fortunately we never needed to contact them. Investigations confirmed our assumption that Diesel was the preferable fuel as especially on the country side always available in India and Pakistan. But newspapers reported that Iran had introduced rations on fuel and one could only buy it by presenting coupons. So we contacted a Japanese trading house and their employees confirmed that we would get coupons from them. Besides the life insurance (just in case for the family) one obviously needs an insurance for the car which proved to be a major problem to get. No Japanese Insurance company was allowed to cover that risk abroad. Only after weeks I found through an English insurance broker the German Tour Insurance in Hamburg which finally issued the policy, but it was tremendously expensive. After a short but specific correspondence I received the insurance certificate covering all the countries en route. However under Indian law additional insurance coverage with an Indian based insurance company was required. I decided to arrange for that immediately upon arrival in Bombay. One other question to be answered was the transport of the car from Tokyo to Bombay. There were a few shipping lines calling Bombay, Japanese and All Indian Shipping Corporation. I decided for the Indian company because I assumed they will have the best and fastest facilities available for discharge of the cargo. In addition their schedule was more in accordance with our plan. I had seen and talked to the captain and officers of the ship in Yokohama in order to secure their assistance at the point of discharge. This proved to be very important in Bombay and saved me a lot of time although two weeks were lost due to waiting for birth of the ship because of the monsoon rains. There was still another important question to be answered, i.e. "who will join me on the trip?". Previous ideas to travel with my whole family had to be dropped a long time ago, because the deeper I got involved in planning the clearer it became that this route was not a family sightseeing trip. However my wife insisted to join me during the first portion, i.e. from Bombay to Delhi. But who will continue with me from Delhi to Germany? One day I called an old friend, Mr. Ryoshi Matsui, and talked to him about my plans. He spontaneously said that he had always dreamed about such a trip, but could not realise it so far. A couple of weeks later he was so excited about it and that he was able to persuade his family, so that I found a partner who, at the same time, was a friend. I had since some time given up to talk to friends about the trip as none of them thought such a trip was possible resp. too dangerous and their advise was accordingly meaningless as they only talked about the danger especially in Pakistan, Iran and East Turkey. Although I had been trying to foresee eventual problems in advance to make the trip as safe as possible a lot of minor surprises awaited us. But I believe these minor surprises are the "salt in the soup" as we say because without them one could book an all inclusive trip to Tenerife. My Toyota Land Cruiser (Diesel) as well as most of the equipment such as refrigerator, canned food, spare parts, repair gear and tool kit, emergency Windscreen, spare tires, spare tanks, water tanks, camping equipment etc. had left Tokyo by ship already beginning of June. Now that the time of making preparations is almost over, the last few days prior the departure are extremely busy. The excitement increases from day to day and so do the worries and nervousness because time is running short to arrange for all the small bits and pieces that might be of importance during the trip. Check-in counter at Narita Airport overlooked the fact that we were carrying too much, among them more than 100 slide films and a 1500 m Super 8 Sound. The Indian customs authorities treated us quite generous as well, as usually the amount of films allowed into the country is far below the number we carried. The letter of introduction granted to us by the Indian Embassy in Tokyo certainly was a great help as well. When planning the trip for the months of July and August I knew quite well that timing was the worst considering the climate and the monsoon season in India. We would meet extreme heat in the Indian, Pakistan and Iran deserts, but I had no other choice due to the school holidays of my children. As soon as we arrived in India , we checked the weather forecasts twice daily. Our "welcome weather" in Bombay was in accordance with what we expected, i.e. heavy rains. It feels and looks like a big water pipe is broken and consequently the streets and parts of the city are under water. The first compensation for the bad welcome weather was the hotel we checked in. The Taj Mahal Hotel is almost an historic landmark of Bombay located near the waterfront and close to the "Gateway to India" which was built to commemorate the visit of King George and Queen Mary. The next day, however, when we visited the Shipping Corporation of India to check about the arrival and unloading schedule of the vessel we had to learn that due to the port being so congested a mooring time delay of up to 12 days had to be anticipated. Therefore the "Mizoram" had only registered on the day of our visit and then sail immediately to South India to discharge cargo there and then return to Bombay. One can imagine our disappointment, as such a long waiting time would either mean that we had to cut short parts of our trip because of the time available or spend less time at each point and cover longer distances every day. From that very moment on we kept on praying that the monsoon would not prolong the waiting time any more. In the afternoon of the same day we went to see the Western India Automobile Association, which we wanted to entrust with the customs clearance procedures of the vehicle. As the "Carnet de Passage", one of the most important documents for the trip was in order only a few papers had to be completed. The authority to be visited next was the customs office in order to establish goodwill. From a Toyota employee we knew that it was only two years ago that the crew of a renowned Japanese daily newspaper was turned down with customs rejecting the entry of their vehicle. As we were not familiar with the proper procedure etc. we asked the customs’ officials for their kind assistance. They promised to help and asked us to return as soon as the vessel had taken berth; thereafter it would take a few hours only to obtain customs clearance. It happened that way with special bounties, however, about which I will talk later. In the meantime and until the return of the vessel we had about two weeks to spend in Bombay . One morning when it did not look like raining at least for some hours, we started to explore Bombay on foot which is the best way to see a city a bit better than by tourist coach which stops at the most interesting spots only. We could sneak into corners and small side streets and lanes which are beyond imagination and something not to be missed. There is the silver market consisting of dozens of small shops which are more or less offering the same. The streets are very small, maybe 3 meters wide only, crowded with bicycles, men carrying heavy loads on their shoulders, taxis, ox carts, trucks - and right between all these - six holy cows were trying to make their way, so that I just had the time to pull my wife aside. Quite in contrast to this atmosphere and as far as architecture is concerned, downtown Bombay still bears the colonial mark. There are still some very nice old buildings and to me these buildings are the best Bombay has to offer, but unfortunately only few, mostly public buildings as well as the Taj Mahal Hotel are well looked after and maintained. Of course, it can be claimed that due to the climate it is difficult and even expensive to maintain these buildings, but it appears that lack of interest plays an important role as well. Another day, I tried to find the "Towers of Silence". These towers were built by a religious group called the Parses (followers of the Zoroastrian religion) who originally came from Persia and some of them are still living there. There is so much to say about them, but there is only one point I would like to mention which distinguishes them from other religious groups. The "Towers of Silence" serve the purpose of disposing of the bodies of their deceased, i.e. the bodies are placed on the top of the towers on an inner ring so that vultures may consume them. The Towers are located in a relatively good housing area and from time to time it happens that vultures carrying parts of the bodies while flying away are dropping pieces. People living there do not seem to appreciate that. Some time later I read a newspaper note mentioning that a vulture had dropped an arm in a garden! Another day when we were strolling around in Bombay , an elderly man approached us asking whether he could show us around. He was a retired schoolteacher with a lot of time he told us. We followed him for about two hours walking from one place to the other till we finally came to a cemetery where the Muslims bury and the Hindus cremate their relatives. I must admit that I did not feel to well staying 2 metres away from a pile of burning wood covering a body of which parts still could be seen. The most macabre scene at the cremation site was a burned down pile of wood with a head, part of the shoulder and the legs still uncremated. As he explained to us, our guide believed that not enough wood was used since the dependants failed to pay enough money for the cremation. After having visited said site we extended our thanks and appreciation to the guide for the time spent with us and gave him the customary tip. Then we left for our hotel to have a few whiskeys. This close confrontation with what will happen to all of us some day was enough of "sightseeing" for that day. On many other days and in order to get familiar with the style of driving in India , I just took a taxi and asked the driver to show me around. So we passed wide roads and narrow streets just for me to find out his reaction on the other traffic. It soon became quite obvious that the bigger and compacter the cars, the more ruthless were the drivers and bicycles had little chances. Since there were still more than 10 days left before the ship with our car would arrive we decided for a small round trip by plane to Varanasi with Ganges and to the Khajuraho temples. After that we took a taxi to Ellora and Ajanta. By boat we visited the Elefanta caves not very far from Bombay. The time went fast and the day of the vessel's arrival came closer and closer. After such a long time of waiting I wanted to see it with my own eyes. At 11:00 p.m. I took a cab to the harbour to which I had a special entry permit issued by the security authorities. When I saw the vessel I got so excited that I decided to return to the hotel and have a good nightcap. The next day would be a hard and busy one. The next morning I could hardly wait for the car sent by the Indian Shipping Corporation to pick me up and bring me to the harbour. Aboard the vessel, Captain Gulati and Mr. Parulekor were waiting for me. As promised earlier, discharging of my vehicle started only a few hours later. The next step was customs clearance. Even though we had notified the officer well in advance, he did not show up before 3:00 p.m. whereas all procedural matters, such as payment of the harbour dues etc. had to be complied with by 4:00 p.m. , as the next day was a Sunday and all the customs offices would be closed. When he finally arrived he wanted to see everything and get some explanations as to why I needed the vehicle. Clearance was affected at the waterfront in the middle of a crowd of longshoremen. Fortunately I had all items box-by-box carefully listed up so that it was easy to submit to him anything he wanted to see within a few minutes only. Finally we got his first stamp on the customs clearance certificates and hurried to obtain the remaining stamps and to pay the harbour dues just before the office was closed. When we returned to our now cleared vehicle which we had left alone for 15 minutes only, we had to find out that most of the stickers were gone, i.e. the stickers with the German/Japanese flags, 4x4 Magazine and Sun Motors. Within these 15 minutes only, the stickers were stolen even though we had asked some gentlemen also waiting for their car to have an eye on our vehicle. The gentlemen we had asked to have an eye on our car had disappeared as well. Considering that nothing else was missing from the vehicle, which happens quite often during transportation with items stored inside a car, we were not too upset about the missing stickers only. When I returned to the customs officer asking him to kindly stamp the Carnet de Passage for the entry of the vehicle and to return my passport he first looked at me as if he did not understand and then replied that this could be done the following Monday only. I immediately realised what he wanted and turned around to consult the gentleman of the Western Automobile Association of India who obviously knew this type of fellow countrymen advised me to help the procedure with some gift. I agreed to do so provided, however, that he, the customs officer, would really comply with my request immediately, as I remembered cases where the gift deemed inappropriate with the consequence that the car was confiscated under a so-called attempted bribery. But after all we also managed to handle this situation. I was promised that my passport would be delivered to my hotel by 5:30 p.m. When it was 6:00 p.m. and nothing had happened I got quite nervous. My nerves only soothed a little bit when the documents were delivered at 6:15 p.m. because I had to start with the second portion of that day's work immediately. I had to re-arrange the interior of the vehicle i.e. I had to take the heavy trunks with spare parts, one spare tire and spare tanks out and put them on the roof rack. This job had to be done in the basement of the hotel because any spectators would cause too much of disturbance. I had 4 hours to finish the job if I wanted to have some sleep before leaving early next morning. It was very hot in the basement and after a few minutes only I was all in sweat. There was only 1 meter space between the roof-rack and the ceiling of the basement and I had to climb up to fasten and lock the equipment properly as we were heading for a long trip and any kind of trouble with respect to the equipment ought to be avoided from the very beginning. Finally I checked the car’s essential technical parts and at around 11:00 p.m. the job was done. I looked all soaked and moved the vehicle to the front of the hotel where the doorman had kindly reserved a safe parking space for me. Within minutes many people were gathering around the Toyota Land Cruiser wondering what such a vehicle was going to be for in India. So I had to give explanations. The people wished us good luck, which we certainly would need on the roads of India . That night we had 3 hours’ sleep only, because I wanted to leave at 3 o'clock in the morning. The reasons for such an early departure are quite simple. During the first day I had to drive for about 15 hours (750 km) up to Udaipur on a road I did not know and of course, heavy rains were likely to be expected during the day. I wanted to reach Udaipur before sunset. And I also wanted to avoid the early morning and rush hour traffic in Bombay , which would cause an unreasonable delay in getting out of the city. As expected it started pouring down soon after we had crossed about half of the city. The visibility was extremely bad. Housing areas, fields and roads were flooded and I had to drive very careful, because one could not spot the big holes in the street which were very dangerous and could cause an early end of the trip. Soon after sunrise traffic increased more and more with mainly busses and trucks. With such increasing traffic I had to pay more attention as well. During the first 4 to 5 hours of driving on the National Highway No. 8 leading to Delhi we passed more than 40 severe accidents with mostly trucks but also a few busses involved. We saw all kinds of accidents, e.g. head-on collisions of trucks, truck and bus, truck against tree or rock, truck in mud and trucks down the slope. Certainly not all these accidents had occurred that night but such a number of accidents I had never seen before. It is necessary to adapt to the style of driving in India, and if one fails to do so, everything will take much longer. The overtaking manoeuvre is indeed an adventure and has to be learned. When overtaking, a sharp eye ought to be kept especially on trucks and buses, i.e. bigger sized vehicles, on the oncoming lane, whereas small cars, motorcycles, ox-carts etc. do not matter that much as they will either stop or make way during the manoeuvre. It must be said that this style of driving is quite enervating. It often happened that I had to escape to the roadside or even into the ditch when a big truck was passing another one and drivers did not care at all about the oncoming traffic. During the next few weeks I found out that there are four main reasons for accidents: fatigue, drunken driving, drugs taken to stay alert enough to drive and car condition. In general, the road conditions of National Highway No. 8 are reasonably good but would not compare with roads in Japan or Germany . The description "Highway" does not at all mean a highway like the Tome, Daisan Kaihin or Autobahn; it is only a 5 m wide paved road with holes that have to be watched out for. After about 10 hours of driving we stopped to refuel; the vehicle had consumed approx. 14 Litre/100 km for the first 500 km. Compared to Japan or Germany the price for diesel in India was approx. Yen 65/DM 0.65 per litre which was relatively cheap. Soon after refuel we continued for the last 5 hours of our first day's driving. For lunch we only made a brief stop to have some canned food, boiled eggs and some iced tea we had made the night before. Whenever we stopped at a gasoline station or to take a break a lot of people were gathering around us touching almost everything they could reach. Now the area around us got a bit hilly and dryer compared with the low altitude and humidity we experienced from Bombay to Baroda. Just before reaching Udaipur we saw the first camels pulling a cart, which was quite an attraction at first but became a familiar scene. As we proceeded we saw camels, camels, camels. There are not only camels on the road but holy cows as well. They are lying preferably in the middle of the road and they do not bother that the traffic has to go around them. Whenever we thought the street was clear, be sure there was a holy cow lying just in the middle of the road around the next corner. They seem to know that it is one of the worst traffic offences to hit such a holy cow. Almost on schedule we reached Udaipur after about 15 hours of driving. We immediately started to look for the "Lake Palace Hotel". In this part of India there are still some people speaking English and with their kind and friendly guidance we soon found the hotel. We had mastered the first day of our trip without any problems and so we felt much better, the tension eased and confidence increased. A letter of introduction issued by the Taj Mahal Hotel in Bombay (the Lake Palace Hotel and the Taj Mahal Hotel are belonging to the same chain of hotels) enhanced the hospitality extended to us even further. We were invited to join the General Manager of the hotel at the Lake Palace Festival celebrated once a year. During this festival all waiters and servants of the hotel are wearing dresses and costumes from the time when the Maharajah of Udaipur was living in the palace himself. Guards in old uniforms and equipped with spears are posted at all corners and the open-air inner court of the palace around the poolside was decorated with flowers. Before we were asked for dinner spectacular fireworks went off illuminating the sky, the lake and the city. When dinner was served and after an exhausting day we felt like Maharajahs ourselves. A few bottles of beer, excellent food and a splendid atmosphere complimented by the performance of beautiful dancers finally made me feel that it was time to go to sleep and take a good night's rest. But before ending with the first day, a little episode I should not forget to mention. After dinner a small snake-like looking thing was served wrapped in a leaf. Nobody was able to explain what it was, except that it is good for digestion. So I tried one. It had an incredible taste, impossible to describe. My mouth filled with water while my host was watching me. So I swallowed, swallowed, swallowed and all my efforts seemed to fail till I finally managed to gulp down everything I had in my mouth. Another experience made in India. Of course, my friend who was going to join me in Delhi had to try it as well, as he was eager to try everything Indians eat. I decided to let him have this experience as well and try this special desert. Today's trip will bring us up to Jodhpur located north of Jaipur and right at the corner of the Thar or Indian Desert. Although the distance to cover is "only" 380 km, I have to anticipate 12 hours driving due to the bad road conditions and also because we have to cross the Aravalli Mountain Range. These ranges are not high but have a lot of winding roads with bends of 90 - 180 degrees. The road is not only bad; it is very bad which means that we have to drive at a speed of 35 km/h maximum. We are passing several villages and it is easy to see what hardship it is to live and survive in such a part of a country. After having crossed the ranges we met nomads camping alongside the road. These people are carrying all their belongings from one place to the other and the time to move is determined by the time their cattle graze the grounds and there is nothing left to feed them. Looking at the site and the area it seems to be a miracle that the cattle find anything at all. Impressive scenery: rocky hills, tents, men, children, a few women, many donkeys, sheep and camels. At 4 o'clock in the afternoon and after 11 hours driving we reach the outskirts of Jodhpur with its fortress over-looking the city. We decide to do a little bit of sightseeing and drive up to the fortress. But how do we get there? I take the direction towards the fortress by driving into the city. Pretty soon, however, I have to find out that this was not the best way chosen to get to the fortress, because the streets got so narrow that I had difficulties with my vehicle to pass through. As soon as I stopped to make sure that I was on the right way to the fortress dozens of people again were surrounding us within no time, begging, trying to sell something or just being curious. How to get on now? I decided to start moving slowly hoping they would step aside. But the street ahead of us was crowded with people almost stepping on each other, which meant that we had entered the bazaar. There is only one thing to do in such a situation, i.e. to keep on driving slowly and carefully so as not to hit any person or animal. The road finally led us to a street winding up to a massive "Gateway of Victory". Here the first of seven barrier gates is to be found with immense portals flanked by guards. In the walls of the Loha Gate handprints of 15 widows of maharajahs can be seen who committed "sati" (an old Indian custom meaning that the widow followed her deceased husband to the funeral pile for cremation and thus to be reunited with him). Close to the fort is the cenotaph of Maharajah Jaswant Singh (+1678). It is built of pure white marble. The top of the fort provides a fantastic view of the whole city of Jodhpur with the huge Umaid Bhawan Palace at the far end. When getting closer to the Palace which is partly rebuilt and used as a hotel, one becomes aware of its real immense size. The palace was built around 1940 and the maharajah had ordered English furniture. A vessel loaded with furniture for the palace sailed from England in 1942 but was sunk by a German submarine and nothing ever arrived. The furnishings of the palace respectively hotel looks very old and worn. We occupied 3 big rooms plus bathroom "with warm water only", because it was so hot outside. When walking to the bathroom I felt like walking through a whole huge house to reach it. The heat in the rooms promised a bad night's sleep and even whiskey did not help but only increased perspiration. It was interesting to notice that all waiters and servants were elderly men, a bit slow but very friendly. My vehicle was parked next to the guardhouse of the palace and I am sure it was well protected when remembering the man in his uniform. On the third day we had to cover about 680 km. When saying, "had to" it means that we had an appointment in Delhi to meet our friend who was going to join me while my spouse was going to leave for Germany . Soon after we had left Jodhpur and got on the road again there was nothing else but wasteland with once in a while small villages. The temperature increased to over 50° Celsius and our air-conditioner had problems to keep the temperature inside the car down at 32° Celsius. We were in the middle of the Thar Desert and yet there were some camels, Sheep and people around but they became fewer and fewer. When leaving the car to take some photos it was like entering an oven. It was there that we first recognised the usefulness of air-conditioning and refrigerator, even though we avoided drinking tea just taken out of the fridge. In this part of India it did not rain for the last 4 years and many skeletons and bones on the roadside confirmed what people had told us. The wind blows the sand across the road and sometimes there is nothing to see but sand. It took us almost 7 hours for 350 km to get to Jaisalmer, a big city in the heart of the desert and built on a huge rock. Again one wonders how people were able to build the fort and the palace under such climatic conditions. The city is very busy with people trading with all kinds of items. We were surprised about the amount of fruit and vegetable available. Jaisalmer has a population of 16,000 only who seem to be all on the street drinking tea, chatting or trading. It all looked like a picture from a fairy tale. We could allow only a few hours to look around and have some lunch, as we wanted to reach Bikaner the same day which meant another 5 1/2 at least to drive. The road and scenery to Bikaner remained more or less the same, through wasteland and desert. On the roadside we spotted some vultures. After a few hours of driving we reckoned that Bikaner could not be too far away any more. There were people, camels, sheep and donkeys again. Upon our arrival in Bikaner we had to ask again for the way to the hotel we had picked to stay. The way we were travelling did not allow any advance bookings so that we had to look for some accommodation in the respective cities from night to night. Such accommodation was either recommended to us or we picked it from a guidebook. In Bikaner we had no luck because the hotel we had picked was closed down and we finally ended up in a so-called bungalow. The room rate was quite reasonable, i.e. DM 20 only per night but the room looked accordingly. We got again "hot water only" not because of the well functioning boiler but rather because of the outside temperature. Anyhow, a shower is something one is looking forward to the whole day. The only problem with a shower at that temperature is that the skin does not dry. Because of the heat it perspires immediately again. Again we looked for a sleeping pill in form of whisky. It worked only for two hours but then we woke up again sweating like being in a steam bath with the bed-sheet all wet already. We were happy when we could get up at 4 o'clock in the morning, or better in the middle of the night, a fact we usually do not favour at all. The temperature outside was by far more comfortable than inside. From Bikaner to Jaipur it is only 320 km or approximately 6 hours of driving, almost nothing compared to the preceding days. Furthermore, we were holding a letter of introduction to a fabulous hotel in Jaipur belonging to the Taj Mahal Group. For about three hours after the departure from Bikaner we continued driving through semi-desert countryside with people trying to cultivate the harsh land fighting the climatic conditions to broaden the living space. Then all of a sudden we noticed dark clouds and within minutes we experienced a heavy shower which was most welcome. Not that the rains only washed the vehicle, to us it was so good to feel the rain and get wet. The hotel in Jaipur was indeed fabulous and, from what we had seen on photos and in brochures, far beyond our expectations. 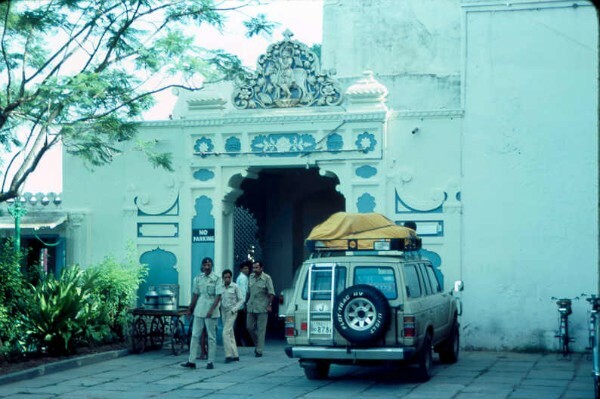 After a rather hectic drive around the city, busy and crowded with people, bicycles, camel-carts and so on to which we were no longer used after almost zero traffic from Jodhpur onwards we arrived at the Rambagh Palace, our hotel. It is located at the far end of the city and surrounded by a beautiful garden with plenty of flowers. Here again the letter of introduction proved to be of great help and we got a very nice room with central air-conditioning. Immediately upon unloading the vehicle it was the doorman who took charge of it by always keeping an eye on it and chased away too curious people. Here at the hotel and as mentioned earlier at all the places we stopped crowds of people gathered around the vehicle asking questions as to its price and our onward stops. That day we spent on the terrace of the hotel overlooking the garden, enjoyed a few drinks and prepared ourselves for next day's sightseeing in Jaipur. The city of Jaipur, the inner circle of which is also called the "Pink City" because of all the buildings made of pink sandstone, is protected by high walls with a total of 8 gates. We could have spent days in Jaipur without even then having seen all of its architectural splendour but set our limits by visiting the City palace which offers a splendid collection of ancient weapons, carpets and paintings. In a short distance only from the City palace there is an Observatory built in 1718 - 1734. When we returned from the Observatory, we again found a crowd gathering around our vehicle, this time for an extra and special reason. It was not only the vehicle that attracted their attention but a bunch of monkeys romping on the roof top and gnawing and tugging on the rain-cover of the roof-carrier. They successfully managed to gnaw a hole in the tilt. However, as this was the sole damage caused so far we could only laugh about it. Thereafter we went to visit the Palace of the Winds (Hawa Mahal), which is a five-story building with a pink facade, constructed in 1799 under the Maharajah Sawai Pratap Singh. On top of a hill not far away from Jaipur there is the Nahargarh Fort. It was built in 1734 by Sawai Jai Singh and provides a splendid view over the city of Jaipur . But the visit to the Fort did not end our sightseeing for the day. Instead, we proceeded to the Amber palace located about 11 km outside of Jaipur on top of a rocky hill. There one had the opportunity to ride an elephant up to the Palace but we voted in favour of our Landcruiser. We admit though that after five hours of sightseeing we had enough of it, so that we decided to return to the hotel and have a break for the rest of the day. The next day we proceeded to the city of Agra with its world famous Taj Mahal. The monument was built by a great Mughal emperor and donated to a beautiful queen as a token of his true admiration, devotion, adoration and love. On the way to Agra we noticed that the closer one comes to bigger cities the more the poverty increases. People in the countryside are certainly not "better off" or "richer" than those in the cities but they seem to care more for themselves. Four emperors of the Mughal Dynasty supported the construction of the massive Fort of Agra at a time when most of our today's cities where still at the stage of development. The most impressive building and monument, however, which we have seen on our journey so far, as far as architecture is concerned, is the Taj Mahal. It was built by (Name) in fulfilment of a promise given to his beloved wife, Queen Mumtaz Mahal, to find her a sepulchre in memory and remembrance of their true and sincere love. It took him almost 22 years to finish it and and it is for 300 years that people from all over the world come to gaze at it in admiration. Some call the Taj Mahal an immortalised love set and embedded in marble. The entire building is made of white marble and when staying in front of it is easy to realise and understand why people having seen it are talking so much about it. The next morning presented us with a quite funny surprise. An elephant on a chain somewhere near the entrance of the hotel tried to reach the roof-carrier of our vehicle with his trunk as some monkeys were sitting there. I started to talk quietly to the colossus, my voice down, in order to divert his attention and after I managed to do so I jumped into the car and moved it to a safe place. That day brought us to Delhi where we met our friend who had arrived the same night. On the way to Delhi we had to face heavily increased traffic and it is needless to say that the behaviour of the drivers changed accordingly. And it was not only the traffic and the misbehaviour of other drivers but there were always people, as is easy to realise, who wanted to get from one side of the street to the other just the moment a car was approaching so that I sometimes felt I needed more than two eyes. And there are the small side streets from where all of a sudden a farmer wants to cross the main road just as if it was made solely for him, not to forget the holy cows which unlike in Rajastan are more common in this region obviously because of the Muslim population. To drive into the city of Delhi is quite funny but not in its real sense. It is difficult for me to describe the traffic conditions and all I can say is that it is unbelievable, just a mess of traders, hawkers, busses, cars, holy cows, ox-carts, motorcycles, bicycles and pedestrians not using the sidewalks as they are supposed to do. But despite all this mess we made our way to the hotel safely and without loosing the direction. The fact that we did not miss the way even once looked to us like a small miracle, since all the directional signs usually appear several kilometres beyond a crossing only. So whenever I had my doubts about the direction I asked somebody for the right way. Even people who had no command of English could at least understand the name of the next city I asked for and showed me into the right direction. It has to be said in this context that the Indians are very friendly and that it is this friendliness that helped us a lot.